Place: Analog Arcade Bar (302 Brady Street, Davenport), a bar offering a wide variety of old-fashioned arcade and pinball games. As of writing, Analog Arcade bar is open Monday through Friday 4:00 pm-2:00 am, Saturday 12:00 pm-2:00 am, and Sunday 12:00 pm-12:00 am. 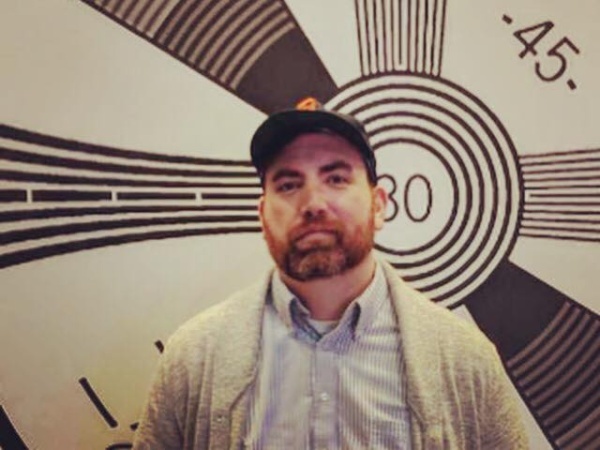 Cal conversed with co-owner Dan Bush about his bar, which houses a multitude of games ranging from pinball to old school arcade games. Buy a beer, and purchase some tokens, which can be used for all of the machines. Analog also features a private room that can be rented out for parties. This is the first installment in a three-part blog series featuring the downtown Davenport businesses Dan's got a hand in. [CH]: Where did the idea of an arcade bar come from? [DB]: I found myself going to a bar in town because they had a Street Fighter II machine, which was one of my favorite games growing up. I thought it would be fun to have a place with a bunch of old games. Then I found out that these places already existed in bigger cities like Chicago, so it made sense to pursue it. [CH]: I think for the older generation the arcade atmosphere conjures up feelings of childhood like the movie "Dazed and Confused", whereas with the younger crowd they see it as this hip new place. Was it a necessity to combine these two worlds? [DB]: Absolutely; it's something that we think and talk about a lot. Selling nostalgia is hot in the short term and cool in the long term, so it’s important that we work to keep it fresh. We are constantly searching for new games that we think people will be into. 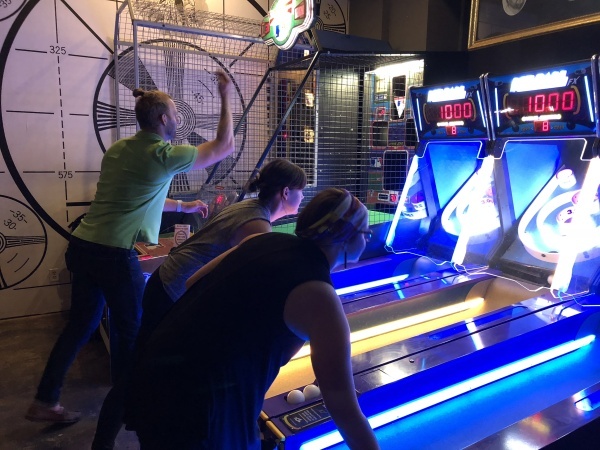 Brendan and fellow Coworkqc members play (and very occasionally win) in a Monday night skeeball league at Analog. [CH]: Your establishment has such a variety of games from pinball, skeeball, Pacman, NBA JAM, Mortal Kombat, and everything in between, Are there a few games you are near and dear to? [DB]: When I’m at Analog, I play Blitz, Time Crisis II, and Tapper a lot, but my fave is Guitar Hero because I have always wanted to be in a band and this is the closest I’ll ever get. [CH]: You versus Owen Wilson in NFL Blitz. Who wins and what’s the score? [DB]: I’m not good at most arcades, but I dominate at Blitz. I would destroy Owen 35-13. Analog Arcade Bar will enable your dream of having a drink and playing that Ninja Turtles arcade machine that you recall playing faintly in your childhood. It's a place that bridges the gap between the past and the present, creating a unique atmosphere that everyone who's 21+ can enjoy. Analog also has several league nights including pinball and skeeball. Show people why you deserve the crown of Quad City arcade champion! Thank you to Dan and be sure to check out Analog Arcade Bar to stay up on news about leagues and which new machines will be hitting the floor soon.